Download the latest version of this hack here. Note that this Let's Play covers version 1.30, so things brought up in this Let's Play may have changed. 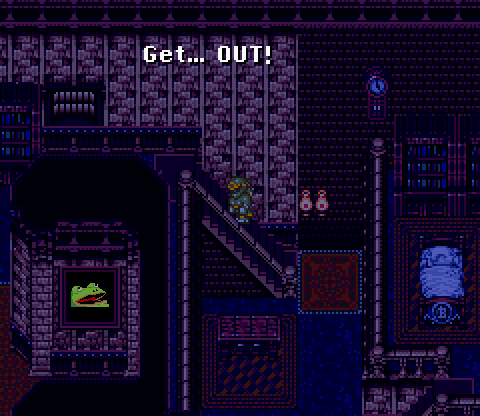 Final Fantasy VI: Brave New World is a ROM hack that completely overhauls the original game. Everything, from text to equipment to monsters to the stats themselves have been changed to keep the spirit of the game while making it so the game itself isn't so damn easy. Now, rather than being interchangable Ultima machines, each character has their own strengths and weaknesses to fill a certain niche in each party. * Characters have been overhauled and rebalanced to fill more specific roles. Locke is a speed demon with some curing magic, Cyan is now a physical juggernaut, Sabin can focus on Vigor to do damage or Stamina to heal with his Blitzes, and Mog can go between a dancer, a mage, and a dragoon depending on where you focus on him. * Certain espers can only be equipped by certain characters. Kirin, for instance, can only be equipped by Locke and Cyan. Also, espers themselves are overhauled, each only teaching up to three spells and giving larger stat boosts. * Characters can only hit L50 now. * Weapons, armor, and relics have been overhauled to give certain bonuses. Dual-wielding and two-handed are now weapon properties rather than given to you by relics. Only certain characters can get access to stuff like X-Magic and the Offering. Many pieces of weapons and armor give side-boosts so that there's more to buying stuff than simply getting the most expensive stuff. * Enemies are tougher so that the rebalanced stuff doesn't simply give you yet another way to steamroll through an easy game. * Everybody says more bad words. Though I've played through the original a few times, I'm doing this hack blind. That said, I'll be making extensive use of the included Printme file, which includes charts of all the equipment, magic, and enemies, and I'll be sure to point out any significant differences I come across (as most of the changes are relatively minor). This LP assumes the reader has played the original game before. Thus, feel free to spoil stuff from the original game, though I ask no spoilers from the ROM hack (i.e. boss attacks and whatever surprises the hack has, talk about characters and stuff in the hack's Readme/Printme files is fine). I'll also be skimming over story segments, summarizing them rather than showing all the dialogue like I usually do. If you haven't played FF6 before, I highly recommend checking out Blastinus's run of the original and vilkacis's run of the Advance version. Both LP's do a great job showing off the game. After that, I highly recommend Elephantgun's Let Break of the game, where she breaks the game sideways and shows off some amazing stuff. Finally, there's Roar's LP of the bizarre Awful Fantasy, in case you needed more ten-year-old forum memes in your life. I post when I update on Twitter for you lurkers and what-not. Chapter 2 - Stealing From Monsters Doesn't Make Sense! Chapter 5 - Yes, I Suplex the Train. That Irish Guy has been providing tons of awesome obscure trivia about the original Final Fantasy VI. Check it out! ddegehna decided to make a tribute to Queen, and, well... read this post. FeyerbrandX nails Sabin's outlook on life. It never really sunk in for me that these brothers have been separated for ten years. They seem so casual when they first see each other again, like they see each other on holidays or whatever rather than Sabin living his dream of owning a cottage, drinking tea, and suplexing bears. vilkacis animates what we were all thinking. I'm going to go ahead and believe that Sabin suplexed Terra into that bed. Then vilkacis goes one step further and caps off the opera arc perfectly. Explosionface commemorates a loss all of us are still feeling. We need a General Leo memorial emote now. Not the traditional dimensions, but close enough? It's fun avoiding doing things I need to do! EatinCake gives us a new perspective on the world. Apparently Google Maps decided to let everyone relive the glory days of mode 7. I can't not see it. ArchWizard puts a goonish spin for the ultimate goon's house. vilkacis makes battle a little cooler. I like how the casting animation makes it look like Celes is adjusting hers. Also how Gau's pose just makes it look like he pushed them up a bit. And of course, it wouldn't be a Let's Play without Explosionface making some fantastic avatars. Only the most comically vulgar villains get two men to clean their boots. Kefka showing the proper way to march through a desert. Edgar tries to figure out which woman to hit on before remembering an important fact. After a quick pass over everything, I have some goodies! This one will never make me feel anything but uncomfortable, I think. There are some others I should be able to squeeze down, but I just couldn't do it with my quick and dirty single attempt. Great LP as always, Mega. Now, after being super busy, super tired, super sad, super listless, and then just tired again, I have things! I had an awesome bum rush gif set up, but it was too big, so I had to cut the framerate in half to make it work. Slightly sped up. Mas better. I just absolutely love how this one turned out.